Max Easton thought he was out. A former British intelligence operative, Easton was living in another part of the world, in a beautiful house, with a beautiful wife. But how did he get there? 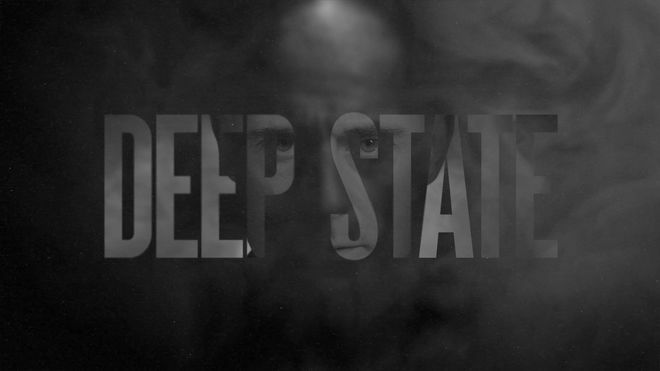 In FOX’s new espionage drama Deep State, he gets pulled back in. 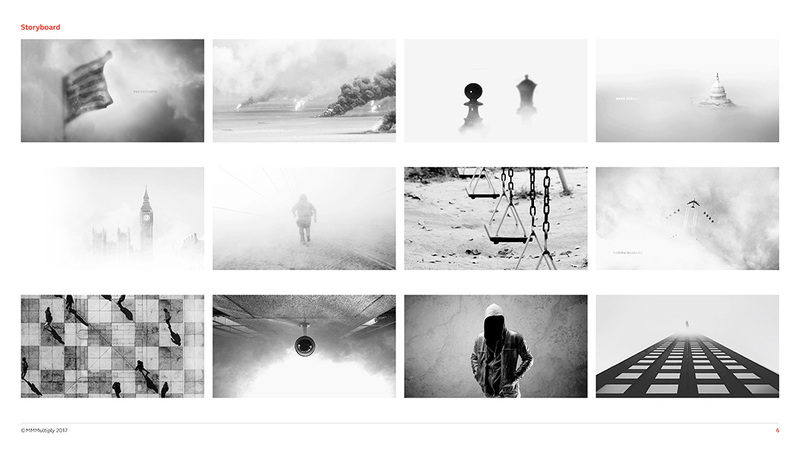 Allegiances are murky, information is unreliable, relationships are a lie and nothing is black and white — except the opening title sequence. 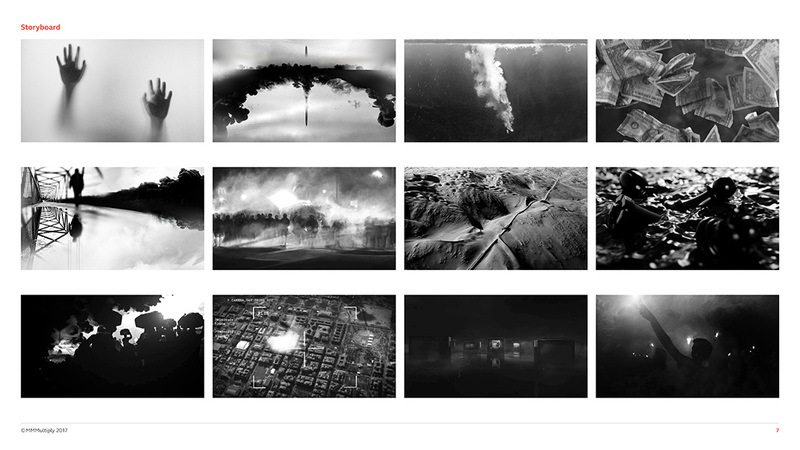 Created by London-based studio MMMultiply, the opening sequence sets up the themes, mood, and central character of the show, ushering us through geographic locations and surveillance footage, through fog and fire and smoke. Mark Strong’s Easton is the complicated, mixed-up man on a desperate chase to prove his mettle as a father and tie up loose ends in order to make good. But the truth is a myth and the smoke is in everything. The theme, composed by Dan Berridge and featuring lyrics from the Talking Heads’ “Once In A Lifetime,” is an unexpected treat. 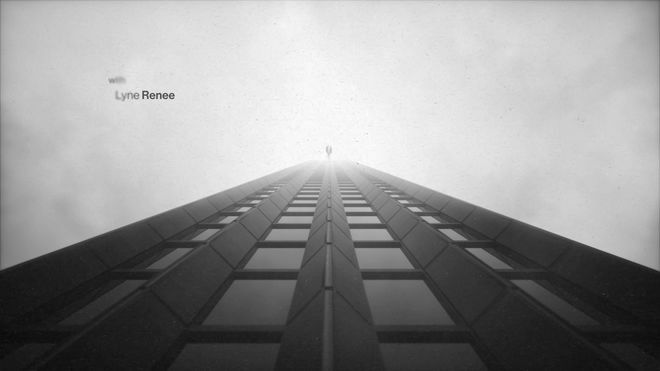 A Clint Mansell-esque piano melody is paired with distorted flutes and rough electronic scratches while a dark voice articulates his confusion. The questions are familiar but the cadence is different, edged in gloom, reeling with shock and anger. As the visuals move from light to dark, the music becomes heavily distorted, descending into a heavy wave of glitches, static, and cymbals. 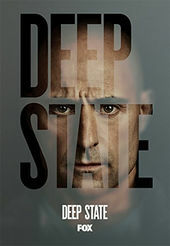 In the closing frame, Mark Strong’s eyes gaze out intently, folding into the angles of the title text and daring us to join him on a journey back into the dark. A discussion with Deep State main titles Creative Director MICHAEL PEARSON of MMMultiply and Composer DAN BERRIDGE. Michael, give us a little background on yourself and on MMMultiply. Michael: MMMultiply began in 2012 when myself and Pete Aldridge, Managing Director, joined forces to start a creative studio that would focus on building a small, multidisciplinary team to work on anything from promos to branding projects to 360º campaigns and beyond. I was keen to build a team that would have a clear desire to be creative in different areas. We met at Ravensbourne College where Pete studied motion graphic design and I was on the interaction design course. Dan, how long have you been a composer? Dan: I've released music for the past ten years as Broadway Project and more recently have been asked to write music for film, TV and ads. I come from a hip-hop and DJing background, but have always had an ear for emotive cinematic music. I came to music pretty late—at 30—and have no formal music training, but have a good ear, thank goodness! How did you shift genres and what was it like moving from hip-hop and DJing to film and TV? Dan: I was asked to write for a few film projects and had to learn fast, but really earned my chops by writing music for TV ads. That taught me that there is a distinction between art and craft. Art is from the heart and involves less thought. Craft is more practical and is about mechanics. Both are honourable in their own way. People get stuck sometimes discerning the difference. What was the first meeting or call about this sequence like? Michael: We’d worked with Sasan Roohi, a Head of Creative at FOX, on projects before. The first contact we had about the show was in March 2017. We were given a synopsis with an outline of themes and locations and the crew attached. Cast announcements happened soon after, so we knew it was going to be a big show for them. While FOX were finalizing the details we went away to work up concepts. 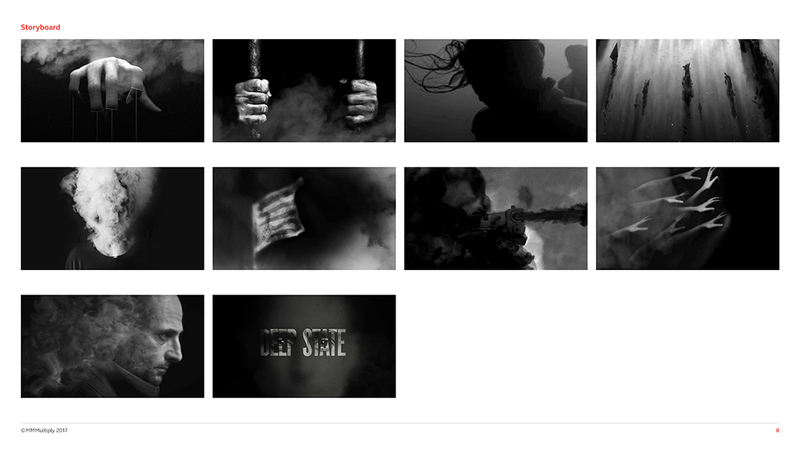 The brief for Deep State was to come up with a concept that would work across everything for launch, from title sequence to identity to campaign toolkit rollout. Dan: This project came to me through Cord, an agency, who asked me to submit a piece for a rough sketch of the sequence. I basically gave them something I had already done with a cut-and-paste vocal laid over. This is the first sort of primetime TV title sequence that MMMultiply has done, right? Is this a new arena for you all? Michael: Pete and I collaborated on a few title sequences for quiz shows and online sports shows before we formed MMMultiply, but yes, it is the first primetime show title sequence we’ve created. It’s exciting new ground. 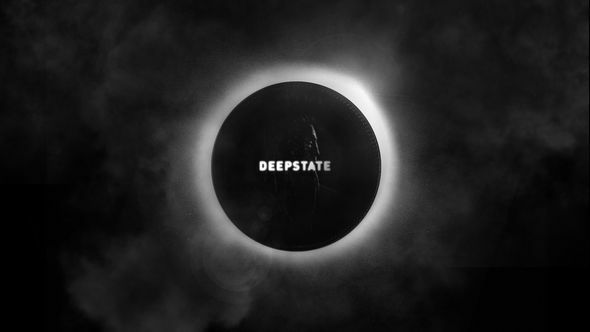 We’re used to creating a clear identity for a show but never one so atmospheric as Deep State. It was a great opportunity to tie everything we’d usually do for a larger brand together for a show. 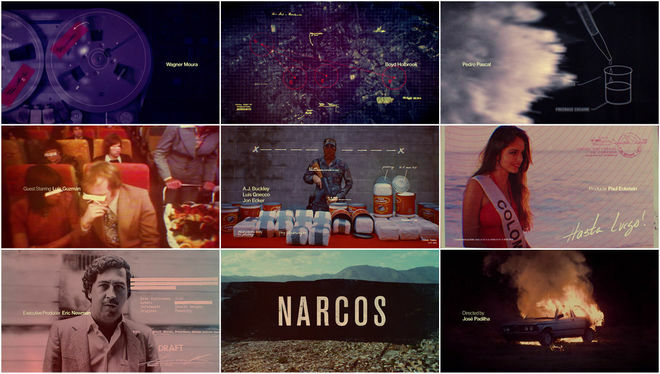 What were the original concepts for the title sequence? How did it develop? Michael: There were a range of concepts originally proposed by us and by the team at FOX, covering espionage themes, which we reviewed and pulled on to develop further. We were keen to steer clear of the edgy classified, redacted route, as it had been done so well elsewhere recently with shows like Narcos. 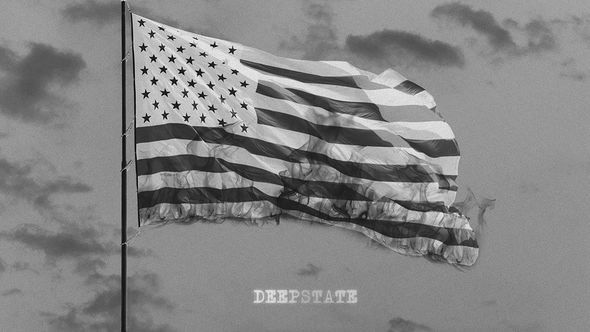 We kept on coming back to the core idea of “control” which is essentially the purpose of the Deep State – control of countries, governments, banks, business, institutions, all invisible to those outside of it. Michael: With everything happening with the US it all felt very relevant – the fake news agenda and the Deep State being called out – but we didn’t want to take it down a route that focused on traditional media and misinformation. We wanted it to be much more visceral than that. Once the top-line concept of control had been agreed on, we went about exploring different ways of controlling and being controlled and how we could visualise that. 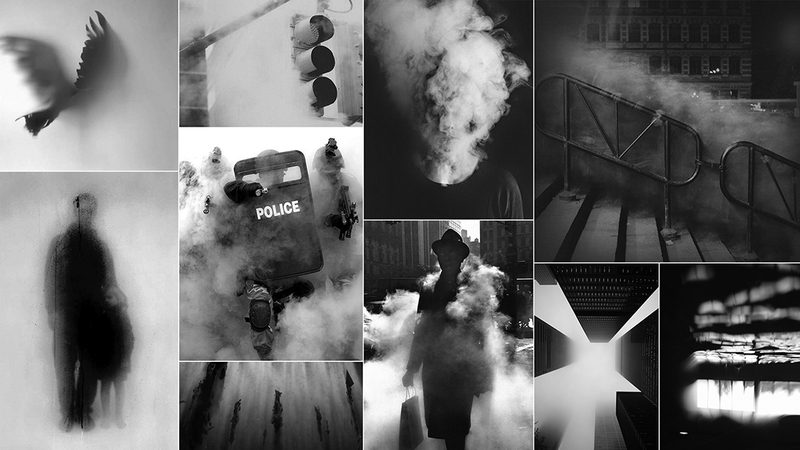 Taking the idea of “smoke and mirrors” and focusing on the smoke as an entity that can control what the viewer sees and turning it into a more malevolent force. What kind of direction did you get from FOX? Michael: FOX were clear that they wanted something bold and filled with iconography, so after the “control” route had been chosen, we started piecing together key visuals for the campaign and storyboards for the titles, exploring different styles and developing a constant for the project. Dan: I had no dealings with FOX. I was several times removed. I dealt with Hollie Hutton at Cord, the agency, who dealt with [MMMultiply], who dealt with the producer of the show, who dealt with FOX—I imagine! I realised at a later stage how anonymous my input was at a meeting for another project where I met said producer and she had no idea who I was! 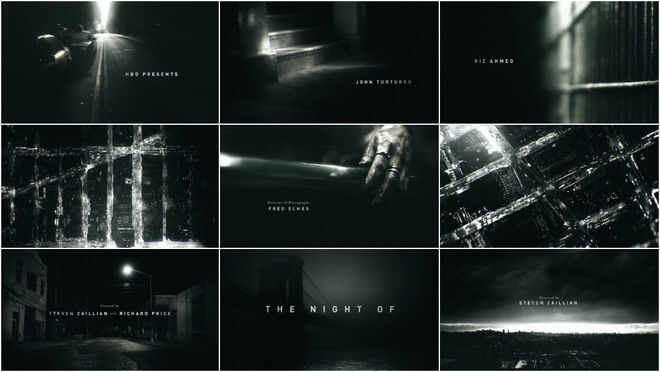 What title sequences did FOX point to as inspiration or comparable titles? Michael: There’s been such an explosion of great TV title design, so there was a lot of inspiration out there. Two shows picked out by FOX in particular were the amazing The Night Of and Homeland. Both sequences had a strong sense of narrative which we liked and wanted to bring to Deep State while retaining a distinct style. Michael: Our motion graphics and post workflow revolves around Adobe CC and Cinema 4D. From Photoshop and After Effects for the styleframes and initial comps, we built what we needed in C4D and then did final comp and grade back in AE and Premiere. There were a few additional programs used, like X-Particles for the smoke, and 3D scanning software for the model of Mark Strong’s head for the latter shots. Michael: The concept was explored by the whole team, then the core of the post-production team consisted of three designers and compositors led by Joshua Thorpe, along with the help of a couple of extra compositors towards the end of the project as we finished the final comp and grade of shots. When did you join the music with the visuals? Were you able to design and edit with the theme or did that come later? Michael: The music hadn’t been commissioned by the time we were at animatic stage, so we used a Max Cooper track that stood out for us from our mood playlist for the project. It gave us something to edit to and set the tone for the final piece of music by Dan Berridge. Dan, what was your composing process like? Dan: This piece was part of a collection of music I was writing, trying to achieve an orchestral-scale sound without using any presets—sample libraries, synth presets, et cetera. There is piano on there but every other sound has been created from scratch. I wrote ten tracks like that. And it nearly drove me mad! But to answer the question: very simple chords and melody amplified to 11 and processed unrecognisably! Michael: The Talking Heads spoken-word layer over the music was something that came from the team at FOX, which they felt rang true with the concept and added to the foreboding atmosphere in the music which was laid over towards the end of the project. Dan: That was there from the start and wasn't my idea. I must admit I thought it was a great plan! I could never have suggested that from the off because of the myriad implications of clearing something as iconic as that. But they took the effort and costs to clear the lyrics. Unfortunately, Talking Heads took all the royalties and credits, meaning I got none! Which equipment, tools and/or software did you use to put it all together? Dan: I used a few old samplers and synths—EMU Ultra 6400, Korg DSS-1, Korg MS-20, Eventide Orville—along with Ableton Live for this piece. And a piano! Michael: As the music was starting to be finalized, we used it to update the edit and to work on the sound design towards the end. Which parts of the sequence did you shoot and which are built in 3D? Michael: There’s a bit of 3D in almost every shot. 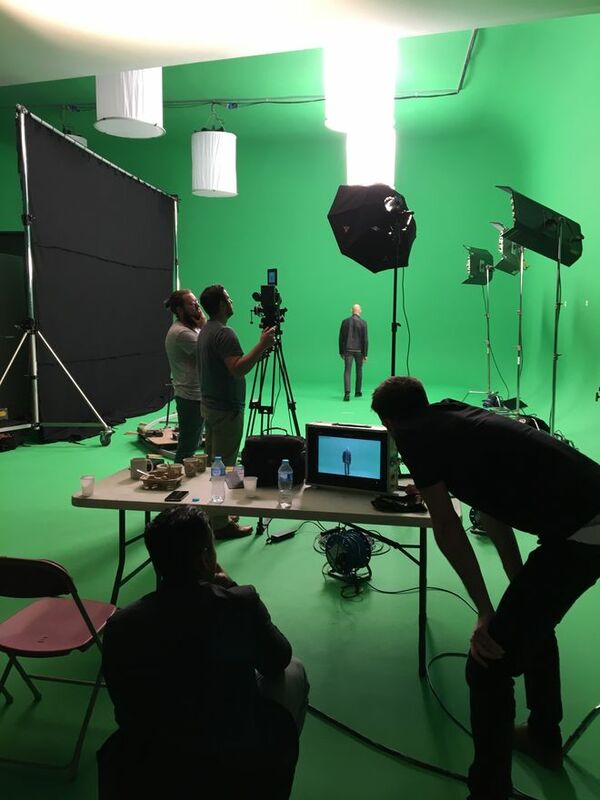 We knew from the start that there wouldn’t be the opportunity for a shoot beyond the one with Mark Strong, which allowed us to be quite playful with the compositions and create some optical effects that we might have been held back from if we were shooting. Michael: Sometimes where you want to go and where you end up are miles apart, but with Deep State we were able to stay very close to the original idea. Even the storyboards and animatic didn’t change too much as we moved from concept to final delivery. Michael: I really like the subtlety of the skyscraper with the man appearing from the fog, along with the opening shot of the upside down flag slowly revealed by the fog which is one of my favourites. Dan: I'm still happy with the main theme melody sound. Very pleased how big it ended up sounding! 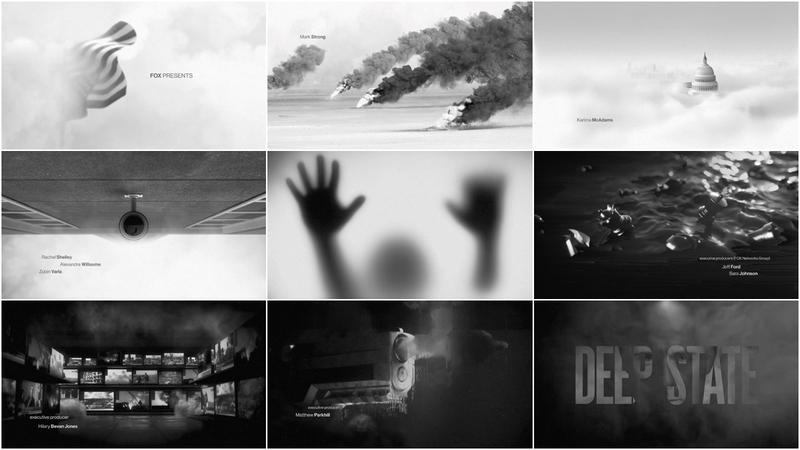 Do you have personal favourite title sequences, classic or contemporary examples that stick out for you? Michael: I’ve always been a big fan of Saul Bass with classics like Vertigo to Casino creating textured visuals that mesmerise on the big screen in the days when everything was a bit more analogue. Kyle Cooper has some stone-cold classics with titles for films like Se7en and Dawn of the Dead perfectly reflecting the tone of the film. Dan: Bernard Hermann’s music for Taxi Driver. I really liked David Holmes' work on The Fall also. The bleeps and distortion on the trailer for the Predator remake are also a big influence. They last about 15 seconds and don't even feature on the film. Michael: I also love the simplicity of some titles, like Black Mirror and Stranger Things, just setting you up for the tension ahead with no frills. Finally, what took you by surprise when working on this sequence? Michael: How exciting it was to see it go out live! When you have campaigns and a high turnover of projects, sometimes you don’t get to see work go out for the first time. Making sure we caught the first showing of the titles on FOX was a must. The titles are something we were hugely proud of and it was a real thrill seeing it on TV for the first time.